Less widely celebrated than the Battle of the Alamo preceding it by a fortnight, the Battle of Coleto on March 19-20 had seen Mexican troops surround and capture another force of Texians at Goliad. Nineteenth-century musketry was a mediocre tool for mass slaughter, especially when the targets were nearly as many as their executioners. A number of prisoners survived the volley and managed to escape the subsequent cavalry charge and bayoneting by leaping into a nearby river. A fortunate few others were intentionally preserved. This thorough site on the massacre** preserves several survivor accounts. Either life or death! Behind were the bayonets of the murderers, and before me was the sword of a coward that crossed my way to the saving stream. Determinedly I rushed upon him. Forward I must go, and — the coward took flight in characteristic Mexican gallantry. Now the path was open, near was the point of my escape. Arriving at the other bank of the river, I looked around once more to where my comrades were dying, while the bullets of the still firing enemies whistled about me. The hellish exaltations of the enemy mixed with the cries of pain of my dying brothers sounded over to me. What feelings took possession of me here! I cast another look and a farewell greeting to my dead companions and turned to flee. I had to hasten if I did not wish to fall into the hands of the lancers who were now on this side of the river less than a half a mile below me. Some one near me exclaimed “Boys! they are going to shoot us!” and at the same instant I heard the clicking of a musket locks all along the Mexican line. I turned to look, and as I did so, the Mexicans fired upon us, killing probably one hundred out of the one hundred and fifty men in the division. We were in the double file and I was in the rear rank. The man in front of me was shot dead, and in falling he knocked me down. I didn’t get up for a minute, and when I rose to my feet, I found that the whole Mexican line had charged over me, and were in hot pursuit of those who had not been shot and who were fleeing towards the river about five hundred yards distant. I followed on after them, for I knew that escape in any direction (all open prairie) would be impossible, and I had nearly reached the river before it became necessary to make my way through the Mexican line ahead. As I did so, one of the soldiers charged upon me with his bayonet (his gun I suppose being empty). As he drew his musket back to make a lunge at me, one of our men coming from another direction, ran between us, and the bayonet was driven through his body. The blow was given with such force, that in falling, the man probably wrenched or twisted the bayonet in such a way as to prevent the Mexican from withdrawing it immediately. I saw him put his foot upon the man, and make an ineffectual attempt to extricate the bayonet from his body, but one look satisfied me, as I was somewhat in a hurry just then, and I hastened to the bank of the river and plunged in. The river at that point was deep and swift, but not wide, and being a good swimmer, I soon gained the opposite bank, untouched by any of the bullets that were pattering in the water around my head. 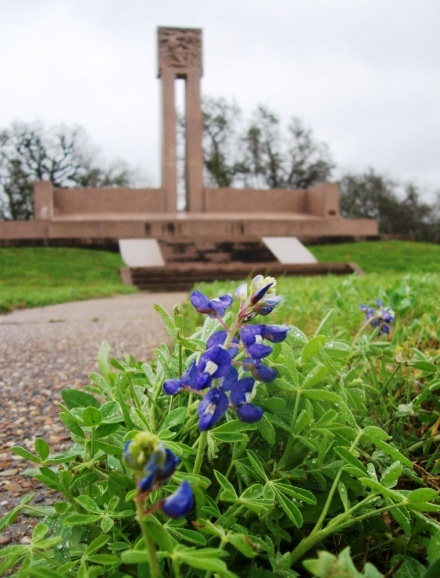 The Texas state flower — the bluebonnet — blooms in front of the monument put up to the Goliad Massacre on its centennial. Creative Commons image from Matthew Lee High. History buffs in the Goliad environs this weekend can catch the annual re-enactment of the Goliad Massacre this weekend at Presidio La Bahia. 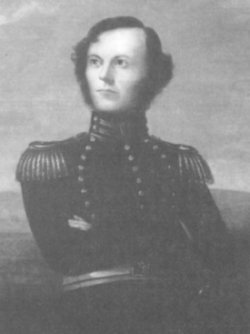 * The order came from the top, but the general who captured Goliad had no stomach to carry it out. He asked for leniency … but received an emphatic confirmation of the execution order. ** Also see its unit rosters tracking the particular fates of most of Fannin’s men, and these biographies of the unit.